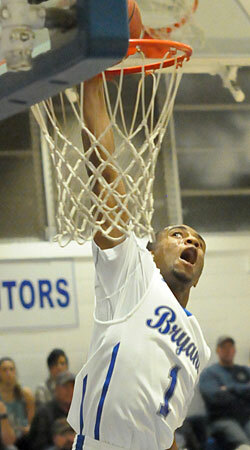 Early in the third quarter, the Bryant Hornets’ lead over the Greenbrier Panthers was just 42-35. The Hornets just couldn’t shake them, despite trailing only briefly. 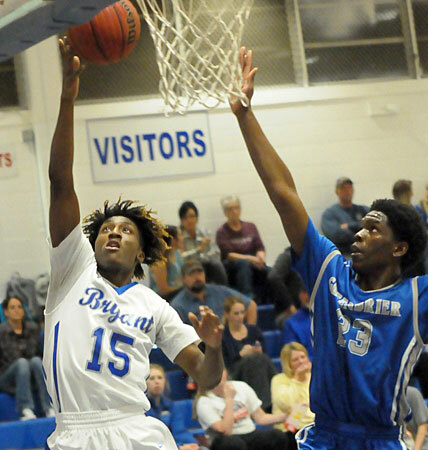 But a 16-2 rush after Greenbrier pulled within 7 along with a withering pace took the Panthers out of it as the Hornets rolled to an 85-54 win at the Hornets Nest. Calvin Allen scored 19 points on 7 of 9 shooting and dished out seven assists while Romen Martin added 15 points and Braylen Steen contributed a double-double with 13 points and 16 rebounds. All 10 Bryant players contributed to the scoring with Sam Chumley coming off the bench to add 11. 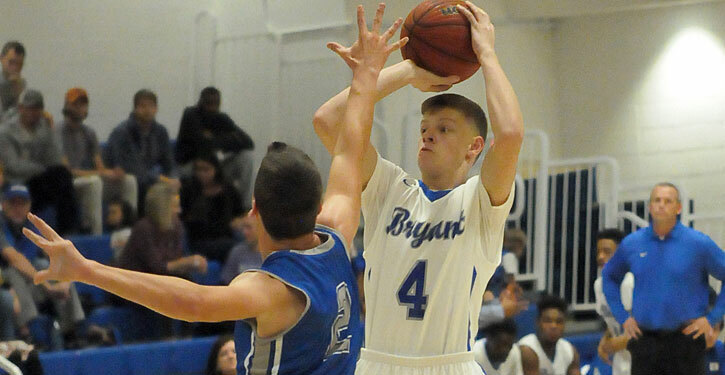 “We scored a lot of points and that’s good, pulled away from them and, eventually, kind of wore them down,” said Bryant head coach Mike Abrahamson. “It was a 30-point win but it wasn’t a 30-point total performance all game. That wasn’t the only thing that got better as the game went along, the coach said. The Panthers were led by sharp-shooting Payton Web’s 22 points including four 3’s. Carter Burcham added 12 and Steven Stewart 8. The Hornets’ game-breaking third-quarter push started with a layup by Lowell Washington, who was hampered by foul trouble much of the game. A driving layup by Allen made it a double-digit lead, 46-35. 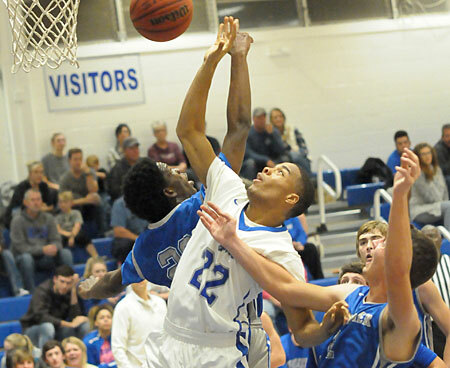 After Greenbrier’s Deondre Smith missed two free throws, Deron Canada followed his own miss twice to score as the run resumed. Martin drove and kicked to Allen for a triple to make it 51-35 and force a timeout by Greenbrier coach Tom Simmons, a former Bryant freshman coach. When play resumed, Martin buried a 3 to extend the margin to 19. Web ended Bryant’s 10-0 run with a layup off an inbounds play but Steen countered with a pair of free throws and Allen fed Martin for a 15-foot jumper that made it 58-37. 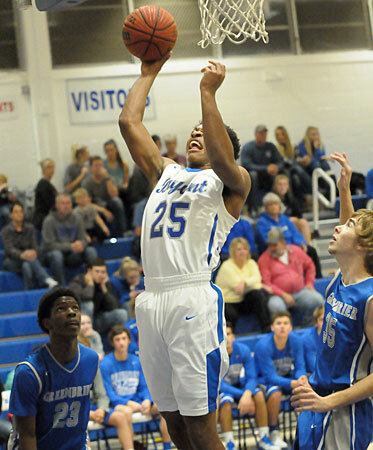 A 3-pointer and two free throws by Web had Greenbrier within 58-42 and the Panthers had a chance to get closer. But Rodney Lambert made a steal for Bryant. Steen scored off the offensive glass and, moments later, Lambert drove for a layup to make it 62-42 going into the fourth quarter. When Stewart converted both ends of a one-and-one to start the final period, the lead was 18. But Bryant scored the next 6 points on free throws from Steen, Turner and Turner. Martin mixed in a driving pull-up jay to make it 68-44. The Panthers managed to whittle the margin to 18 once more by the 2:50 mark. After that, the Hornets finished with a 13-0 surge that included 8 of Chumley’s points. Christian McIntosh made a steal and a layup along the way and, to cap things off, sophomore Henry Terry nailed a 3 from the right corner to set the final score. The game had been tied repeatedly in the first quarter. After leading 3-0 on a triple by Stewart to start the game, Greenbrier managed a 15-13 lead late in the period. But Steen blocked a shot by Burcham and, at the other end, Allen flashed for a layup to tie it. Moments later, Allen fed Canada for a layup and a 17-15 edge going into the second quarter. The Hornets got a little daylight at the start of the second period. McIntosh fired in a 3 off a feed from Martin. A free throw from Martin made it 21-15. His second shot was rebounded by Turner, who couldn’t get a shot to fall. 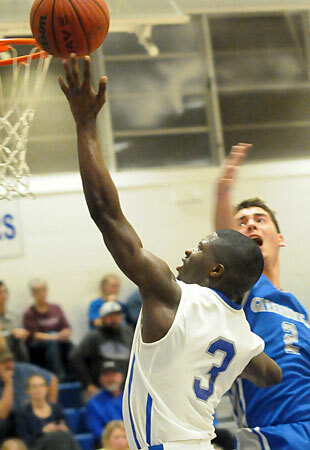 But Martin rebounded the miss and was fouled again. This time, he converted twice. Web popped a 3 only to have Lambert pick up a loose ball, score and get fouled. Though he missed the free throw, he got another bucket off a dish from Allen and it was 27-18. After a Greenbrier timeout, Martin took a charge as Stewart barreled through him on a drive. It was one of two charges that Martin absorbed. Allen’s 3 and a free throw from Martin made it 31-18 with 4:30 left in the half. To their credit, the Panthers rallied. When Web closed out the quarter with a trey, Bryant’s lead was down to 38-31 at the half. To start the second half, Washington and Web traded buckets then Steen and Burcham took turns. Bryant’s game-breaking run commenced at that point. The Hornets head to Bentonville for the Crabtree Classic on Thursday. They’ll open at 4:45 against Clarksville then take on Bentonville at 7 p.m., on Friday. Saturday morning at 8 a.m., they’ll play Wynne in a game that was originally set for 11:15 a.m. but was moved up because Wynne’s football team will be playing in the Class 5A State football championship game in Little Rock at noon. Stewart 2-4 2-2 8, Burcham 4-13 3-5 12, Web 7-13 4-4 22, Smith 0-2 1-4 1, Harmon 0-1 0-0 0, Thomey 1-5 1-2 3, Tilley 3-6 0-1 6, Brown 0-2 0-0 0, Vanover 0-0 2-2 2, Wilson 0-0 0-0 0, Flake 0-1 0-0 0, Jerry 0-2 0-0 0. Totals 17-49 13-20 54. Martin 5-11 4-8 15, Turner 2-5 1-2 5, Allen 7-9 3-4 19, Steen 5-10 3-4 13, Washington 2-3 0-2 4, Canada 2-5 0-0 4, Chumley 4-6 2-3 11, McIntosh 2-5 0-0 5, Lambert 3-4 0-1 6, Terry 1-1 0-0 3. Totals 33-59 13-24 85. Three-point field goals: Bryant 6-18 (Allen 2-2, Martin 1-6, McIntosh 1-4, Chumley 1-3, Terry 1-1, Turner 0-1, Canada 0-1), Greenbrier 7-17 (Web 4-8, Stewart 2-2, Burcham 1-3, Thomey 0-2, Brown 0-1, Jerry 0-1). Turnovers: Bryant 7, Greenbrier 13. Rebounds: Bryant 14-27 41 (Steen 6-10 16, Canada 2-4 6, Chumley 0-3, McIntosh 0-3, Allen 1-2 3, Martin 2-0 2, Turner 1-1 2, Washington 1-1 2, Lambert 1-1 2, team 0-2 2), Greenbrier 10-17 27 (Thomey 2-4 6, Harmon 1-3 4, Stewart 1-2 3, Smith 2-1 3, Web 0-2 2, Tillery 1-1 2, Brown 0-1 1, team 2-2 4). Team fouls: Bryant 19, Greenbrier 23.